The Study Bible gives you a wealth of resources from John MacArthur and Grace to You to help you understand and apply God’s Word. 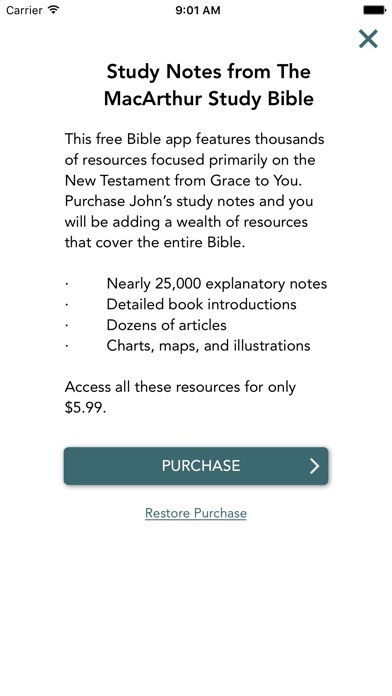 Featuring the English Standard Version (ESV), the New American Standard (NAS), and the King James Version (KJV) texts of Scripture, you have immediate access to Grace to You’s sermon archive, featuring more than forty-five years of John’s Bible teaching (well over 3,000 full-length messages) covering the entire New Testament and portions of the Old. With The Study Bible you can: - Read or listen to Scripture in ESV, NAS, or KJV - Show or hide verse numbers for a great reading experience - Hear John MacArthur answer Bible questions - Highlight Bible passages, add your own study notes, and bookmark verses - Synchronize personal data across multiple devices - Read study guides, articles, and three of John's daily devotionals - Follow the MacArthur Daily Bible to read the Bible in a year with note that explain each day's reading With the in-app purchase of the notes from The MacArthur Study Bible, you’ll have access to nearly 25,000 detailed comments by John MacArthur that explain virtually every passage in the Bible. 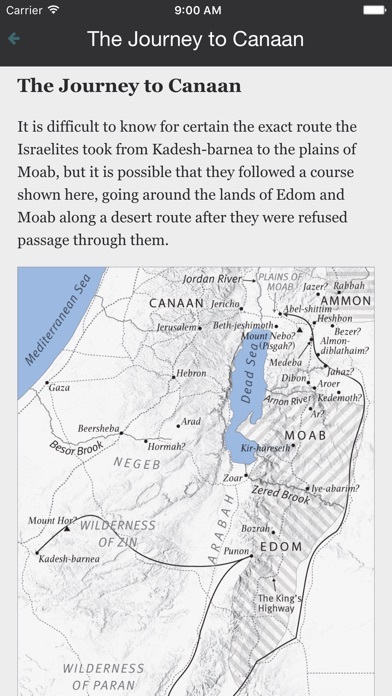 Along with the notes are dozens of articles, charts, maps, introductions to each book of the Bible, and more. 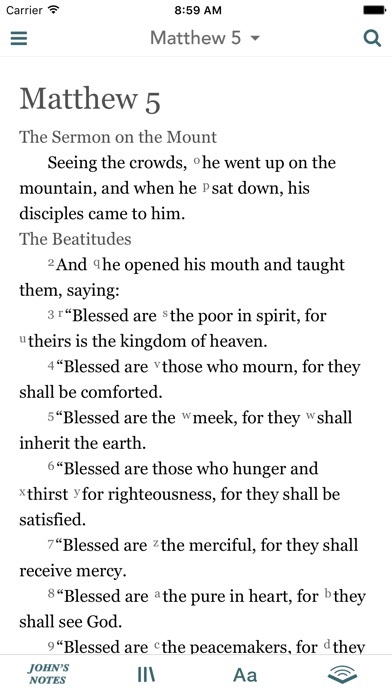 I love this bible app. I literally use it almost every single day for reading and for studying. It is my go to app for quick referencing and in depth searches. I have so enjoyed this study Bible! And it keeps getting better and better! The study notes are spot-on!! Excellent interpretation and explanation! I've used a MacArthur study Bible for many years! I love how I can search a topic or verse and it comes right up. So handy! This study Bible has enhanced my spiritual growth and has been an incredible blessing! Truly a work of God made possible by the leading of the Holy Spirit!!! Thank you, Dr MacArthur and Grace to You! This app has everything. You can read and listen to the Bible in several translations. There are links to JMac’s sermons as well as many different kinds of resources to include articles, maps, charts, etc. There are four different daily devotionals. When you read them they get a checkmark and you can even set an alarm to remind yourself. You can add your own notes to verses. You can read the study notes from his study Bible. Whenever a verse is mentioned in any of the resources you can click on the link and it will take you to that verse in the Bible and then you can easily go back to where you were. I cannot recommend this enough. I have never had any sort of technical issue with the app. 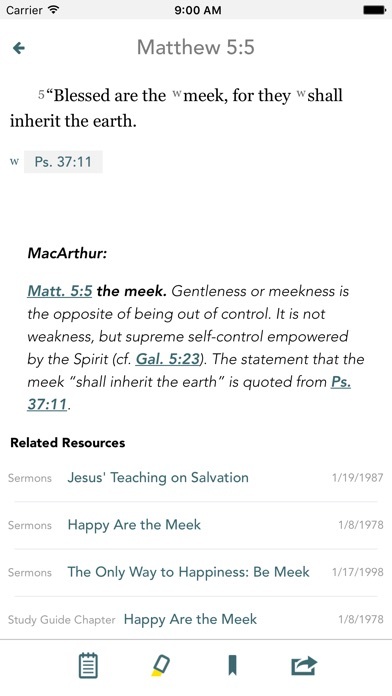 John MacArthur's ministry has blessed me enormously, I use this app every single day to read scripture as well as use his commentary to help me better understand it. There are daily devotional to chose from as well as links to other resources within the commentary. I love the app and the idea behind it. When it doesn’t freeze it really is wonderful. 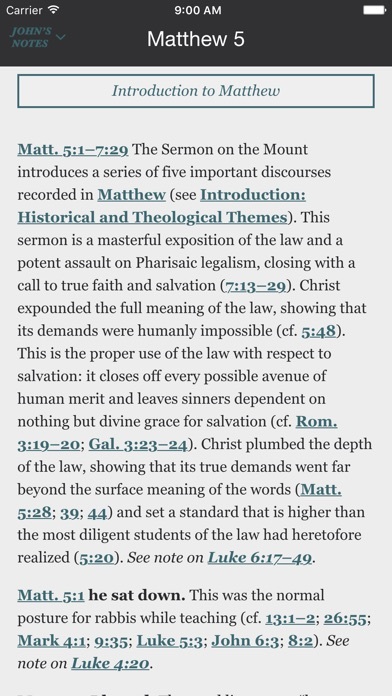 I love being able to access sermons and sermons notes note to mention the MSB study bible info. But the app frequently freezes and then after a moment or two jumps to the last chapter of revelation. The best Bible app ever? Keeps freezing and jumping to revelation. I have to keep going back to try and find where I was before the freeze. Very annoying and disruptive to my study.